Langstone Harbour entrance, west side. Approach from Fort Cumberland Road, turn into Ferry Road, after Southsea Marina on the left hand side turn right down a tarmac lane immediately before Eastney Cruising Association compound on the right. The ramp in immediately in front at the end of the lane. Ample free parking on gravel to the right of the ramp, however there is a height restriction bar at the entrance to the car park. The ramp itself is concrete and in good condition, although it can be swept by gravel on the lower parts. It is accessible at all states of the tide, but sometimes the end of the ramp is scoured by the tide and there is a drop-off at dead low water. However, the main tide run in Langstone entrance is very strong and it is advisable to have side bars on a trailer, or launch and recover at high or low tides. You need a permit to use Langstone Harbour, which can be purchased from the Harbour Master on the Hayling Island side of the entrance. There is a 10 Knot speed limit which is enforced by the Harbour Master. 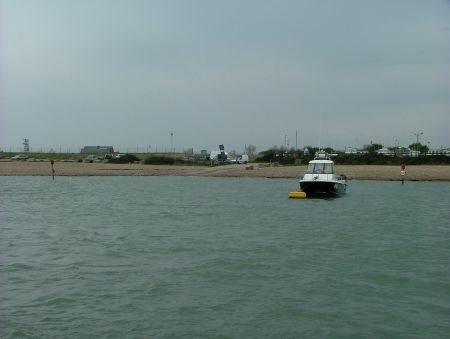 There is a wide concrete ramp accessible at all states of the tide on the eastern shore of the entrance channel to Langstone Harbour, accessible from Hayling Island. The ramp is by the Ferry Inn, at the very end of Ferry Road. This ramp is less convenient than on the Eastney side as it is by a busy pub and parking is more restricted. On the plus side, it does have a pub! Once you have launched, you can park in the car park nearby but there is a charge. The tide runs strongly here too, and you have the additional problem of the ferry landing stage right by the ramp. Take care that your boat is not swept on to the wall or pontoon on a flooding tide. I have not used this launching ramp myself, so the following information is taken from www.boatlaunch.co.uk . I hope they don’t mind. There is a wide ramp with a barrier entry system. You will require £2.50 to operate the barrier. Recent construction has reduced the width of the ramp so that it will only take two cars at time and occasional fishing boats on the slip can reduce width to one boat. Still a good place to launch. Bottom of the slip does get slippery but four wheel drive cars do not seem to have much problem pulling boats up at low water. Jet skis are not allowed to launch from here. Warsash: a gently sloping shingle hard useable at all states of the tide, near the mouth of Hamble River on the eastern side. There is a pay car park nearby. This site gives access to marks in Southampton Water and the Solent, but it is a bit of a long run to the “real” sea. Stokes Bay: there are two ramps, one at the northern end, one in the middle. They can be difficult if there is an onshore wind, and can often be covered in loose shingle. There is pay parking very close. This site gives access to Eastern Solent marks. Chichester Harbour – Itchenor: a gently sloping shingle hard usable at all states of the tide, but is often crowded in Summer and parking is limited to a small pay car park at the other end of the village. The site is sheltered and gives access to eastern marks. You have to pay harbour dues to use Chichester Harbour. There is another hard at Dell Quay and at Northney Marina but these are even further up the harbour away from the sea.